How is the navigation on your website? Can your visitors easily find your landing pages as well as your products and/or services pages? If your website is too complicated and people can’t find what they’re looking for, you’ll need to do a redesign. When people visit your website, what do you want them to do? Having clear call-to-actions are crucially important to generate leads and it can be done through a variety of ways. Some popular call-to-actions include an email newsletter sign-up, a contest, a giveaway, a whitepaper, an ebook, or a discount or some other kind of promotion. Make sure the call-to-action is easily visible through a button above the fold on your homepage or landing page. Believe it or not, there are companies that still do not email their customers regularly. Sending out an email at least once a week is a great way to continually receive new traffic on your website. Your traffic, however, will only grow if you add more email subscribers daily. A good way to do this is by occasionally offering something for free like an ebook, a whitepaper, or a contest or prize giveaway. If you’re not receiving much traffic on your website, you’ll need to take a good look at your social media and SEO efforts. Social media can help bring in a steady stream of visitors as well as more engagement to your site, especially if you’re offering something your audience wants. Along with social media, you’ll need to make sure your website is driving enough organic traffic for targeted keywords on search engines. SEO will bring in more traffic than even social media and PPC combined if it is done correctly. 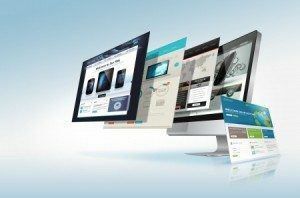 Many company websites are missing landing pages, which are crucial for online marketing efforts. Landing pages drive consumers to your call-to-actions so they don’t have to hunt through the navigation on your homepage to find the ebook, whitepaper, giveaway, contest, or promotion you are offering. Landing pages will also help you capture more email addresses and accurately measure online traffic. As you can see, there are plenty of things that can prevent the success of your website. Make sure you’re avoiding the things mentioned above so you can drive more online traffic. Do any of these five things accurately describe your website or do you have any other questions about how to generate more leads online? If so, leave a comment below.